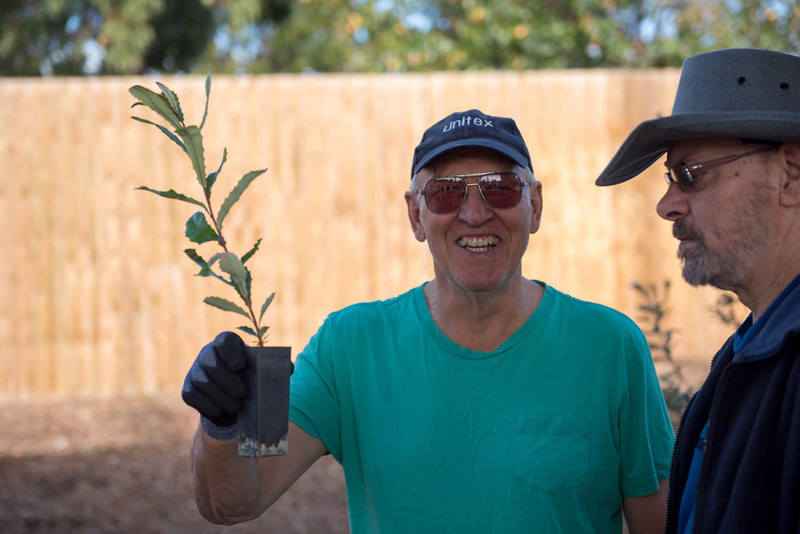 Community members who worked with us during the Seaford Road level crossing removal took part in planting some of the 100,000 Indigenous and native trees, shrubs and grasses to help bring the area to life. Coast and swamp banksias and coast tussock-grasses were planted near Seaford’s new underpass on the corner of Seaford Road and Railway Parade. All the banksia trees were grown locally at the Frankston Indigenous Nursery from seed collected in the area. We heard how important trees and vegetation are to the community – species were specially selected to retain and enhance Seaford’s natural bush look and feel and reflect the Indigenous heritage. Wood from removed trees has been donated to council and local groups, and used for habitat logs, while the public furniture has been crafted from plantation sugar gum. We’ve got a busy schedule of planting ahead with Seaford students set to muck in later this month. The second stage of major planting will get underway later in the year to maximise survival rates. Revitalisation works on the new playscape, upgrades to RF Miles Reserve as well as work to build six kilometres of new walking and cycling path will continue into early 2020. Seaford footy fans heading to the MCG won’t have to wait at the Seaford Road level crossing as the road reopens to traffic in time for Grand Final weekend.